Welcome to my Living Room Tour! We have a small joke in our house that certain rooms belong to each one of us. Rooms where I can mess up because it’s mine and Mr. P. can mess up because it’s his and the children of course (no they don’t have their space) they can mess up Daddy’s room because he is at work. haha I claimed this space long before it was even decorated. I like watching out the front window people passing by, on their way to work, or walking their kids to school. I also claimed it because it’s the only room in the house besides bedrooms that has carpet. I hate cold feet, and I hate wearing socks so carpet is a must for me. So here is MY living room otherwise known in the UK as a front room or lounge. When I first was thinking of what I would do with this space, I was sat on the floor, with a huge swollen belly, two weeks late with Buba and nothing was in this space yet. I had a very different picture in my head of how I would decorate it and the color scheme. I do like it now but it wasn’t what I wanted at first. It’s cozy at night with the light of the lamps and comfortable in the winter to cuddle up amongst all those pillows to read a good book which is more important then the overall theme. I first envisioned light cream with navy accents. I love navy! I made one of those amateur moves in the furniture store, I saw it, glanced once and said yup I want that one. I thought I was getting a cream sofa with navy stripes. It looks so great in the showroom under the fluorescence lights, even in the brochure it looked navy and cream. What really came was gold and black stripes but at the point of almost giving birth I didn’t care, it was something to sit on. I ended up decorating around it with gold wallpaper and a black fluffy rug. It took awhile to take form but once I added the cranberry pillows and a few more cranberry accents I felt better about it. I even planned our family photo outfits to match the decor knowing I was going to put them above the tv. I am always thinking ahead! We got lucky and had a huge family discount for Laura Ashley so most of our furniture and accents we got at a super bargain price. Thank you family discount. But I much prefer to shop at places like Home Sense and TK Maxx, finding one off pieces and items that you know no one else would have. I am all too good about hiding things behind furniture and doors. The kids toys are stuffed behind my favorite armchair, where I sit many hours at night bloggin away and my coffee sits cold next to me, on top of my keepsake boxes, they make such a good side table. I was so sick of diapers, wipes and various creams stacking up behind the living room door unorganized so I bought a brown wicker drawer unit from Bhs of all places and it’s been bliss ever since. There is enough space in each drawer for everything I need for both Buba and Missy Moo and fits nicely behind the door so no one can see it. I am obsessed with digital photo albums. I got this little stand with my last album order so that I can display my latest album like a photo in a frame. Visitors can open it up to see our family adventures. 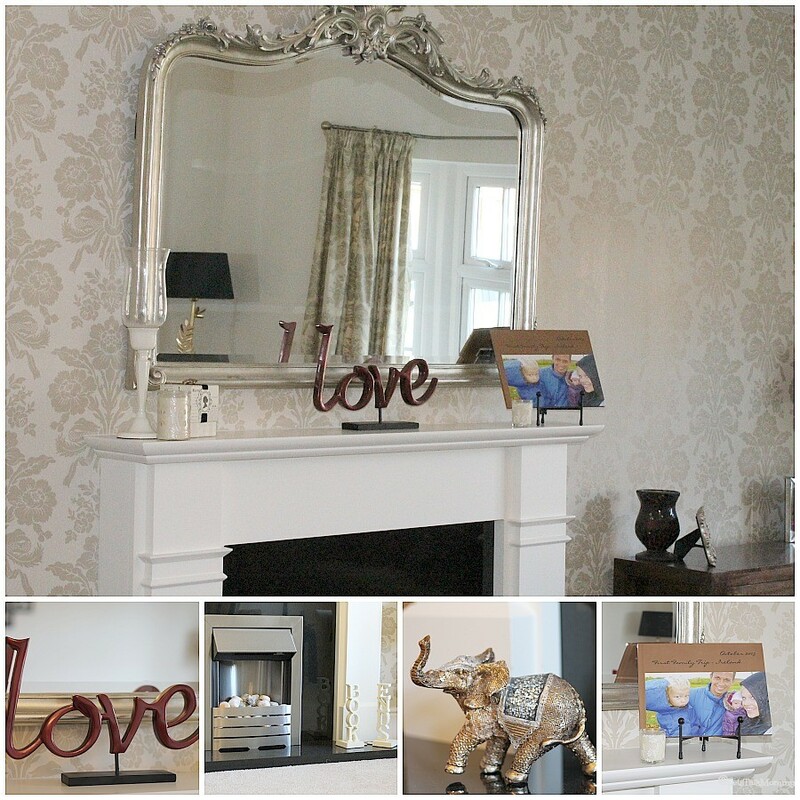 This little elephant and LOVE symbol was from Home Sense as well. I love that there was only one in there and I haven’t seen any sense, my unique little accents. Although, Buba has broke the nose on the elephant about four times. I would have loved to have a real fireplace but knowing I would have small babies in the house for awhile I opted for the fake ambience. I did have a gorgeous picture frame on a pedestal that matched the big mirror over the fireplace but Mr P and Buba decided to play soccer in the living room and broke it beyond repair. This is the downfall of shopping at Home Sense because I can’t buy a replacement. Boo. My two couches were bigger than I expected, so it was hard to fill the space where they met in the corner. Nesting tables gave me the opportunity to fill the space and pull them out when guests come over to put their coffees/teas on for easy access. I love the newborn picture of Buba next to the phone. I also have one below of Missy Moo next to my cranberry vase. Little reminders of my sweet little babies and how small they were at first all scrunched up. They are only a few days old in both pictures. Next to it is my favorite picture of my parents and Mr P’s parents on our wedding day with us. Only just realized you all can see my hiding place, these shelves and behind it. Throw blankets get stuffed between the shelf and the wall. Books and random pictures that I have no more space for, get stacked here too. lol I guess it all has to go somewhere. This is my somewhere. This brown unit from Next was about the only piece of furniture that we brought from our old house as the new owners only wanted the house with all the goodies in it. haha Gave me a reason to revamp my home sense and get things that suited this house instead of trying to place items from the last house in random places. If there is one thing I would change is the gold. It makes taking pictures a nightmare in this room because it doesn’t reflect the light enough but I chose it way before I started on my photography journey. Light cream would have been better. I couldn’t believe how different the couch color looks under our lights here than they did in the showroom. You wouldn’t even guess it’s the same couches. Next time you are shopping, be ware of the lights in the store, it may look different once it’s in your house. 1. Think of the room flow first. Where is best to place the tv, bed, couch? I draw it on a piece of paper and try various options before deciding. Furniture placing is best to do first before you think in terms of accents and accessories. 2. Next I pick a theme or color scheme. I usually pick a neutral color and then a strong accent color that I can change if I get sick of it without incurring a lot of cost. For example. my living room is gold and black with a strong cranberry accent. I can change all the cranberry items out at any time with another color without incurring a lot of cost because I have a neutral base color to work with. 3. Take your time. Don’t rush decorating a room. I spend months on each room in my house slowly adding items and moving things around. I am still forever working on them. 4. Start big. Paint and/or wallpaper first. Buy furniture, window dressings, entertainment center if it’s for a living room, beds and wardrobes if it’s a bedroom next. Think of painting a canvas you don’t start with painting the little birds in the sky first. For bedrooms, move onto bedding and wall accents: maybe a shelf or a photo collage to personalize it. For living rooms, move onto wall accents and lamps. 5. Mini accents and accessories come last, like my cranberry pillows, my elephant, or my keepsake boxes in this room. Things you find over time as various shops. Maybe a vase with flowers or book ends that bring character to the room. This is the bit that takes the longest time, don’t rush it. What do you think? Want to see more of my home and interior decorating, check out these room tours below and stay tuned for next week’s room tour of my kitchen. I made it to the finals! Please vote for me for Best Baby Blog & Best New Blog! It’s awards season in full swing. Not much longer to vote for BiBs! I am new to the scene of blogging but really enjoying this journey both in writing and meeting all of you fantastic bloggers! If you like what you see,please consider me for Fresh Voice / Social Media ! Id love my lounge to look that *grown up* and gorgeous but its *owned* by the bratlings, so I have given up!! I love your room – we are planning on starting in October time (garden first, over the summer!) then living room in the winter months. I want a wallpaper very similar to yours – something quite classic and timeless. I think the plan is to go dark gray (charcoal) and cream. I’d like lime green as the strong colour, but haven’t convinced my boyfriend about that yet! Glad it gave you some inspiration. My back room aka Mr P man cave and kids play area is lime green as the accent color. Mr P wasn’t keen at first but he loves it now. Charcoal grey would look awesome with the lime green. We left the garden until last now we wish we had a nice garden to sit in oh well get there eventually. 😉 Stay tuned kitchen next week and a room a week for a grant tour of our house. Thanks for commenting. What a lovely living room, it looks really cosy and I love the finishing touches you have done. 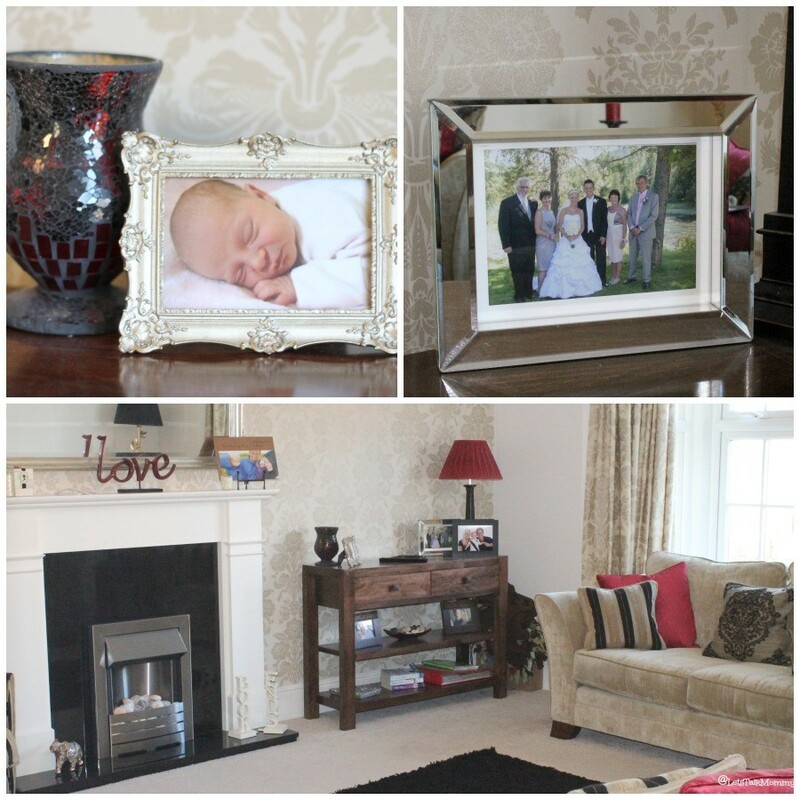 I recently posted my living room makeover, we have just had ours all done. Oh I will go check it out. I love home decor. I really love lime green and mustard colors too. Lime green is in our back room but Mr P would let me go with mustard. 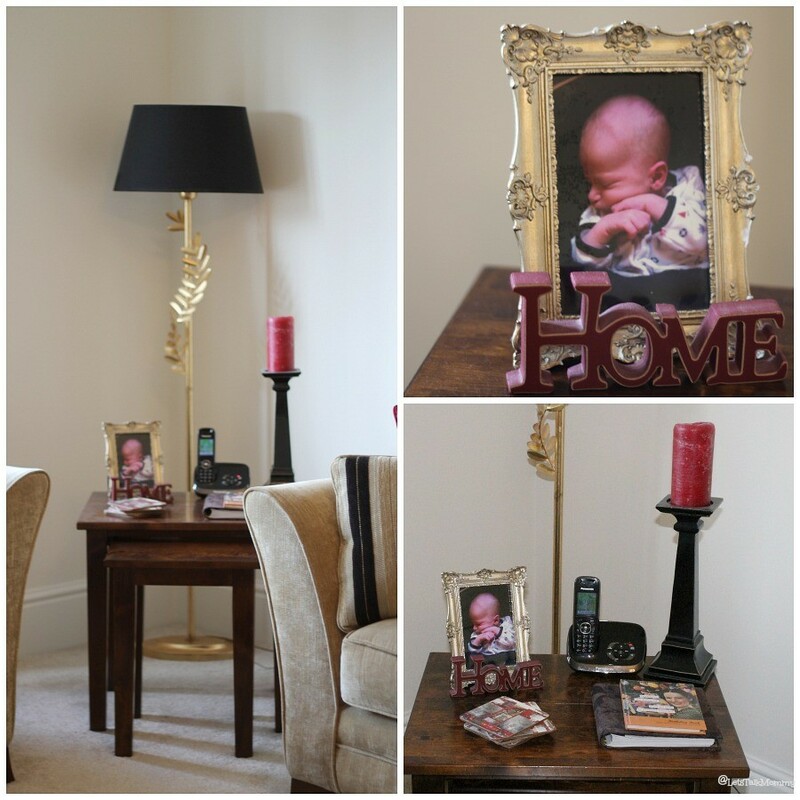 I am doing a room tour a week on my blog as I slowly finish off our house since I moved in right as I was about to give birth I hadn’t had the time to do anything with it until now. Thank you Chantelle. It wasn’t what I wanted at first but it’s growing on me. Sometimes I feel like it’s too old for me and other times when the lamps are glowing at night I love it with all that gold glowing. We’ve got a lot of decorating up do over the next year or so. I hope it all comes together! Every time I see it I love it then the next minute want to redecorate. Needs more rooms. lol Thanks for stopping by. Love the new look of your blog btw. This is a such a well designed room! Serious home envy happening here!! wow you definitely have a gift. I love so much here-the velvet couch, the tall lamp, curtains, wallpaper. So beautifully put together. I think I am going to have to pinch the wicker draw idea I am sick of wipes and things on our window ledge. Thank you Emma. hahaha no velvet couch but it does look like it in the photo hahaha Yes do pinch the wicker drawer idea. It fits perfect behind any door and it’s so cheap from Bhs online. Honestly best thing I did with two in diapers and the mountain of wipes and creams everywhere. lol Not sure if its a gift but it definitely is a passion. Stay tune for the kitchen and rest of the house in weeks to follow. I am taking Interior Design and your blog post is like awesome!!!! What a fab room! We recently decorated our living room too and it seems we have totally opposite tastes but I love the way you’ve put everything together! 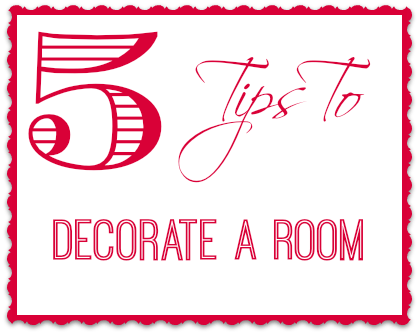 And the tips at the end are great too- I tend to just bumble through it when we decorate! We’re trying to get through all the rooms this year so I will definitely come back to this post for advice! Hahaha I used to be that way and then I took time on this house because I had just had two babies back to back. Lol glad you like it. It is a bit French style isn’t it. Thanks for popping over. Thanks Maxine. I did try. They seem to be everywhere with a baby and toddler at the moment. Oh doing show homes would be so much fun. How exciting. Lucky u. This room is just gorgeous. What a lovely home you have! I love the wallpaper. Thank you Katie. Glad you like. I am doing a room tour a week and other decor posts. I love home decor and interior design. I used to want to do it for a living well still do. Maybe someday. Stay tuned for more glimpses into the room I have decorated. Buba and missy moos rooms are up too. I have hiding places, too! Love the story about buying the sofa. Welcome Lucy, thank you for popping over and commenting. I am new so haven’t been blogging long. Glad you like the living room I have also just shared both of my kids rooms which the link was in the post too. Would love to hear what you think? I used to want to decor homes for a living. Still do, but sticking to mine at the moment. Oh my goodness, it’s beautiful. So opulent and yet it looks really comfortable. I can imagine myself curled up on your sofa, cup of tea in hand. You must love spending time in there. It truly is my quiet space. I love it. 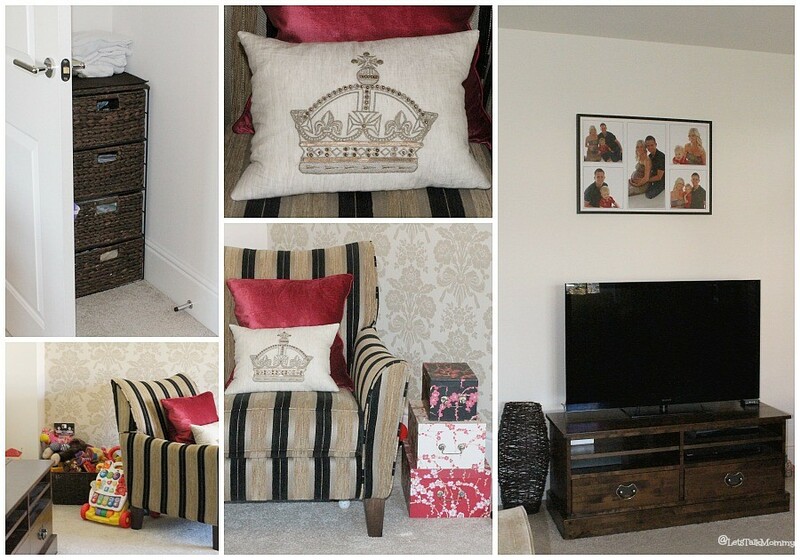 I blog a lot in this room in my armchair by the fire with my cuppa on the keepsake boxes. it makes a perfect side table. hahaha Thank you so much for stopping by and checking it out. My kitchen tour will be up sometime this week. I am doing a post a week! For a whole home tour. I was the same. Every time I picked a theme I changed it again. I would love to redecorate again because I love different themes and colors. Home interior decorating fascinates me.